The government of Western Australia is trying to speed up the development of port and rail facilities of the Mid West region’s Oakajee port by stripping the Mitsubishi/Murchison combination of exclusive development rights and inviting Chinese parties to step in. 8 of the 14 projects in development in the region have Chinese investors. Anglo American launched a range of claims in Chilean court trying to prevent Codelco from being awarded the right to buy a full 49% of the Minas Sur assets. The scope of the option for Codelco to buy 49% has been unclear since Anglo sold a 24.5% stake to Mitsubishi. In response to Anglo’s claims Codelco restated its intention to acquire 49% of the full project. As expected Chinese investments have proven to be a key driver of M&A activity in the mining industry in 2011. It is noteworthy that many Chinese firms are using a foreign based subsidiary or team up with a Western firm to do foreign investments. This structure holds 2 main benefits for the Chinese investors: they obtain an experienced western staff with knowledge of the way of doing business in the target countries; and they are viewed much more favorably by regulators when trying to execute deals. The fight of Anglo American and Codelco over Minas Sur appears to become a long term court fight. The longer this court fight stretches, the more inclined Anglo American will be to find a compromising deal, as the uncertainty about the ownership structure will delay all investment decisions for the company in the mining region. Earnings of the industrial metals miner with many operations in India dropped despite revenue increase of 43% for the half year. Reduced earnings were caused by losses in the aluminium group and by a weak rupee (with 45% of revenue in India). Only days after Anglo agreed to pay $5.1bln for a 40% stake of De Beers, it decided to sell a stake of its Chilean Sur copper project to Mitsubishi for $5.4bln. The sale has led to disagreement with Codelco, which claims to hold an option on 49% of the total project, not just on Anglo’s share. Caterpillar is adjusting its geographic footprint by buying a Chinese manufacturer of underground coal mining equipment and by increasing capacity of mining truck manufacturing in Indonesia and the USA. China’s enormous market is still predominantly using equipment from domestic brands. Though the results for Vedanta were not met with enthusiasm on the markets, they were in line with the strategy set out by the management in May: growth, long term value, and sustainability. Vedanta currently chooses to increase its market share instead of generating high profits, in the awareness that the current development will for a large part determine which companies will be the emerging market multinationals of the future. The fight between Anglo and Codelco over the ownership stakes in the Chilean copper assets is flanked by a fight by Japanese co-investors and traders. Codelco sided with Mitsui to build its 49% stake at a low valuation, but Anglo found a way to get a higher price by selling part of the asset to rivaling keiretsu Mitsubishi. The M&A overview of the Business of Mining has been updated with Anglo’s 40% acquisition of De Beers. Anglo American agreed to pay $5.1bln to the Oppenheimer family to gain control of diamond miner De Beers. The other 15% are owned by the government of Botswana. De Beers changed CEO in May of this year and tried to strengthen partnerships and simplify the ownership structure. A blast in a state-owned underground coal mine killed eight miners. 45 miners that were initially trapped underground were rescued within two days via a rapidly excavated tunnel. Diamonds already accounted for 11% of Anglo American’s revenues, and will get close to 20% now. The simplified ownership structure will help De Beers to undertake the large investments in both new project development and modernization of current operations required to retain its leadership position in the global diamond business. Additionally, Anglo Americans global footprint will help De Beers to diversify its production footprint, which is still heavily skewed towards Botswana. Safety in Chinese mines is still far below Western standards, but under pressure of federal regulation the situation is improving rapidly. Unsafe mines are often forced to close temporarily, and rescue teams are becoming better equipped to safe the lives of trapped miners. Official numbers show a 2/3 decrease of fatalities in the past 10 years. However,the surge of coal demand in the country is putting the safety improvements under pressure, as mine management is willing to go a long way to increase output. “China’s Minmetals Resources has launched a C$1.3bn (US$1.25bn) takeover offer for Anvil Mining, a Toronto-listed copper producer, in a move that underscores the rising international profile of Chinese mining companies. Chinese miners have been slowly but steadily advancing their overseas presence, as China’s consumption of key commodities such as copper, gold and coal continues to grow. Minmetal’s made a bid for Equinox in April, but withdrew this offer after Barrick offered a higher price. Minmetals acquired many assets of OZ minerals in Australia in 2009. 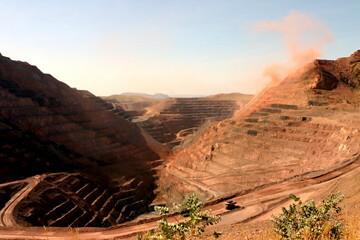 Its mining division MMG is mainly managed by western managers and operates mines in Australia and Laos. Anvil’s most important asset is the Kinsevere copper project in Congo, which is expanding to a 60,000tpa capacity and has proven and probable reserves of approx. 750 thousand tons contained copper. Anvil’s board informally put the company up for sale last month although it is in the process of a fully financed expansion program. Analysts expect the move to be driven by the large shareholders that want to cash in on their investment. Minmetals will continue to look for $1-7bln copper investments in Southern Africa, trying to expand its portfolio and potentially build on the experience of Anvil’s management. According to the Economist stability in the Katanga copper region is uncertain as the strong governor of the province has decided to leave the office next year. Congo’s copper assets will certainly be in the center point of attention in the coming year.